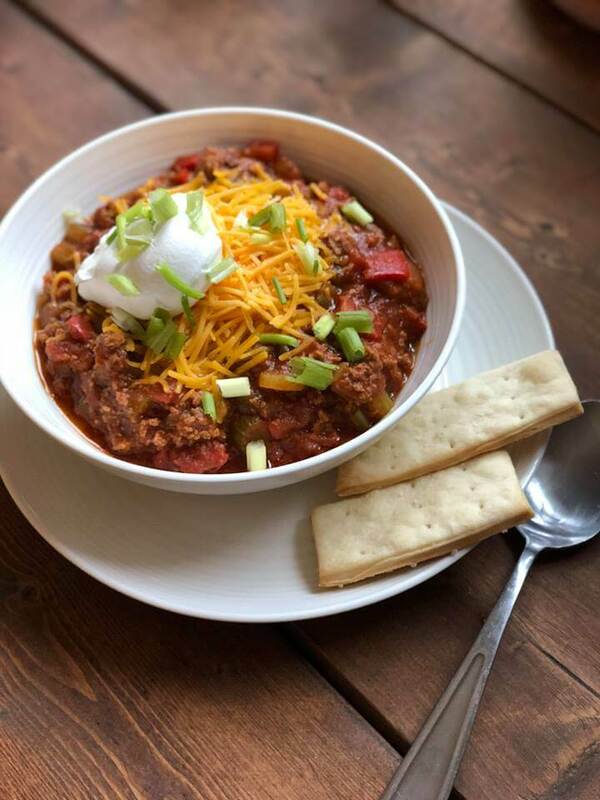 This chili recipe is AMAZING. Dusty has requested it multiple times since I first made it. It’s tasty and comforting during the colder seasons. I love making it in big batches and freezing some of it for a day when I don’t have as much time to prep it. It’s that good – that leftovers are totally OK in our book. I’m positive you’ll enjoy it too. Brown meat of choice in a pan. Chop your peppers, onion, and celery. Add olive oil and garlic to a stock pot on your stop top. Once heated, add in your chopped veggies. Stir until tender. Add both cans of tomatoes and diced chilis. Stir together. Add seasoning packet. Add cooked meat. Add 3 cups of water. Simmer for an hour. Serve with green onion, cheddar cheese, and sour cream on top!